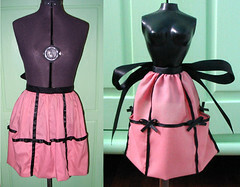 Colorkitten's Action Blog: the apron! Originally uploaded by angry chicken. Sarah! If you remake the mini-apron into human-apron, I think the apron strings ought to be really HUGE too. You can't see it in the crappy photo, but the big one actually has 4" wide tafetta for the waistband so it's almost as huge looking! I definitely won't try this pattern again without using a stiffer fabric though. Great job on the aprons! I think women look great in aprons. I'm an idiot -- OF COURSE you know TIE ONE ON. Oh, well. I was trying to be helpful!